Register now for an amazing educational camp experience designed for young science and space explorers! In addition to engaging educational activities, campers tour inspiring Space Center Houston exhibits including Mission Mars, Independence Plaza and our seasonal plaza exhibits. Campers also watch live presentations and films and go behind the scenes at NASA Johnson Space Center. 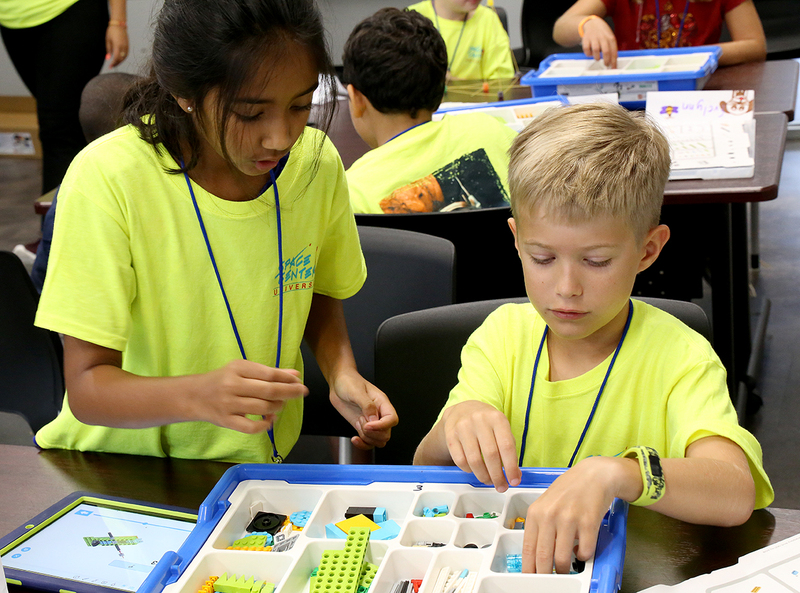 Campers will discover how science and technology can solve problems that astronauts will face when they travel to Mars in this five-day learning adventure. Participants will fulfill their curiosity using age-appropriate robotic platforms through hands-on activities. Your engineer-in-training will be introduced to STEM principles and out-of-this-world fun. Campers will discover what it takes to sustain life beyond Earth through activities that will ignite his or her interest in science along with their sense of adventure in this five-day camp. Your astronaut-in-training will engage his or her creativity through engineering skills as he or she learns the basics of rocketry, discover coding, and explore hands-on science activities. This five-day Martian adventure will challenge junior scientists to seek solutions to the obstacles of deep space travel. Participants will engage in engineering design challenges, use robotic platforms, and delve into topics such as geology, radiation, and rocketry. This five-day Martian challenge will inspire your junior engineer to collaborate and find solutions to the complications of deep space settlement. Participants will engage in engineering design challenges, use robotic platforms, and delve into activities such as thermal and habitat design, and rocketry. Wait lists are available for sold-out camps. Contact our Reservations Department at +1 281-283-4755 or reservations@spacecenter.org to be added to the waitlist. Before-care is available 7-8:15 a.m., cost is $15 per day. After-care is available 3:30-6 p.m., cost is $15 per day. Please schedule and purchase before- and/or after-care 48 hours prior to the date needed. Campers may bring their own lunches or make an advance purchase of a camp meal plan. All meals include an entree, choice of Lays® potato chips, Cheetos® or Doritos®, choice of water, small Powerade® or milk and choice of small yogurt, apple sauce or fruit cup. The spring camp meal plan costs $45 for the week. Meal plans must be purchased two business days prior to first day of camp. Campers will be provided with one camp T-shirt during camp check-in. Campers will be required to wear the camp T-shirt daily. Extra camp T-shirts may be purchased for $15 during camp check-in. Commemorative camp patches are available for $7 and can be purchased during camp check-in. The medical information and image release forms MUST be received five business days prior to the first day of camp. Camp registrants will receive an email to electronically sign the forms prior to the camp. If you do not receive the electronic forms, please contact our day camp educators at camps@spacecenter.org. Cancellations must be emailed to reservations@spacecenter.org and received no later than 14 business days before the first day of camp in order to receive a full refund. Cancellations made after the 14-business-day deadline will not be refunded. If Space Center Houston cancels a camp, a full refund will be issued to all registrants. For more information, download our Explorer Camp Policies and Procedures (pdf). Do you have before-care and after-care? • Before-care is available starting at 7 a.m., for a charge of $15. • After-care is available starting at 3:15 p.m., for a charge of $15, and operates until 6 p.m.
• Please register for pre-care two (2) business days prior to the date needed. 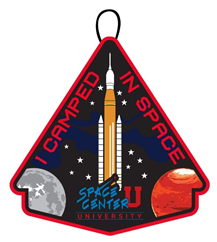 • The doors to Space Center Houston open for camp check-in at approximately 8:15 a.m.
• Campers must be picked up by 3:15 p.m. to avoid the $15 after-care charge. • Please register for before-care or after-care if you are not able to drop or pick-up your child during normal camp hours. • Campers will be given a camp T-shirt at check-in on Monday morning. For the safety of the campers, this shirt will need to be worn to camp each day, all week. • Additional camp T-shirts can be purchased at check-in for $15. • Closed-toed shoes should be worn to camp each day. What should I expect at camp check-in? • Campers and parents will enter Space Center Houston at the main entrance, through a designated camper check-in door. • Parents will need to sign-in their camper(s) at their designated camp table. • Parents will be given a hanging car tag with their child’s name. This tag is to be placed on the rearview mirror at check-out. You will keep this card for check-out for the entire week. • Camp T-shirt will be given at check-in. • Campers will be escorted by camp staff to the theater where they will begin their camp experience. 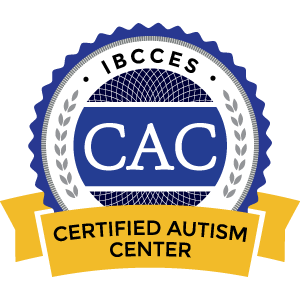 • Parents of special needs children should indicate their child’s special needs on the Medical Information Form, which is due to Space Center Houston five (5) business days prior to the first day of camp. • Once a parent indicates that their child has a disability, impairment, or condition, a representative from the Space Center Houston education staff will contact the parent to discuss reasonable accommodations for the child. Does Space Center Houston provide lunch? • Campers may bring their own lunch or order a meal-plan for the week. • Check the seasonal day camp Parent Guides above to find out meal plan prices. Meal-plans must be purchased two (2) business days prior to the first day of camp. • Meal plans come with a main dish, a choice of chips, dessert, and drink. Check the seasonal day camp Parent Guides above to find the meal plan menu. • No glass containers are allowed. • There is NOT a microwave available to campers. • Campers with food allergies will be required to sit at a special table to avoid food contamination. Where do I pick-up my child each day? • Check-out is between 3-3:15 p.m. each day. • If you have not picked up your camper by 3:15 p.m. you may be charged $15 for after-care. • When coming to pick-up your child from camp, the parking fee is waived. Please inform the toll-booth attendant that you are picking up a camper. • Look for day camp pick-up signs to guide you to the checkout area. • In the event of early pick-up, please go to Guest Services, located inside Space Center Houston. You must show your ID in order to pick up a camper early. Contact Reservations at +1 281-283-4755 or reservations@spacecenter.org for more information. 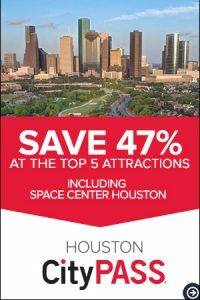 Receive a 10 percent discount by becoming a Space Center Houston Member today.